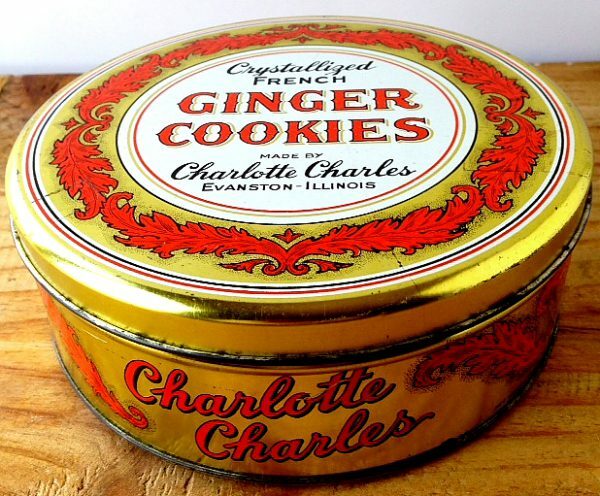 I wrote about the story behind this vintage tin from a company called Charlotte Charles over four years ago, but only recently heard from a reader who found something to continue the story. A woman named Ann came across my blog. 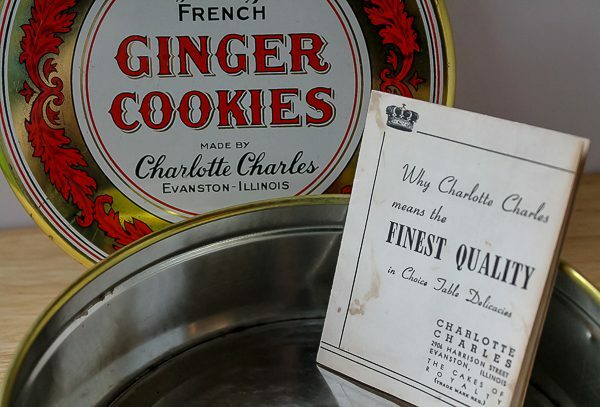 As she was going through some kitchen items of a relative, she found a history and recipe booklet from Charlotte Charles and thought I might enjoy keeping it in my lovely tin. It may be a tiny piece of paper, folded to fit inside the tin, but it contained more history about the real Charlotte Charles of centuries ago and the wonderful food items she used to make for kings and aristocrats in France and Russia, along with a few recipe ideas from the ancestor who renewed the business here in Illinois. The business has not been around for decades, but the fascinating story lives on. Thank you, Ann, for this piece of history about amazing women and their culinary accomplishments. Wouldn’t you love to taste those French Ginger Cookies? Another reader who found my blog happens to be a romance novelist and has written many books. Julia Blaine wanted to send me one of her books of my choice. Besides the romance novels, Julia once wrote a children’s book which caught my eye. Not only is it about Halloween, perfect for October, but I would have a new book to read to my granddaughter. 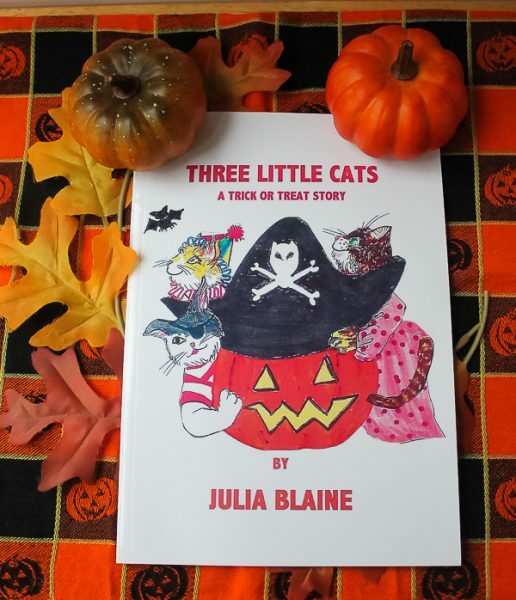 The main characters are cats, which happen to be my granddaughter’s favorite of the moment. Thank you, Julia! Check out Julia’s books here. 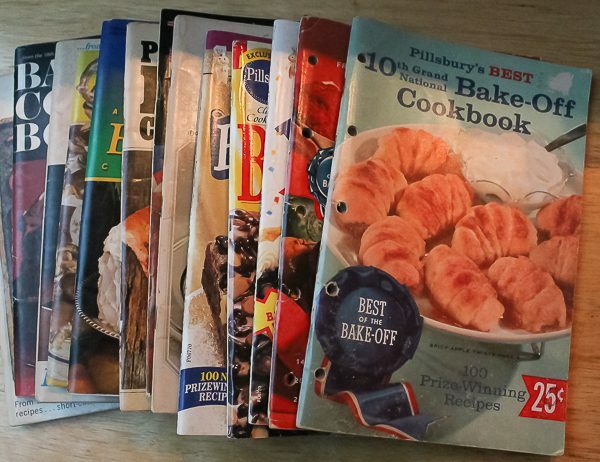 Next along came a box with some Pillsbury Bake-Off books, which I collect. They were from Sherry Little whom I met years ago at a National Beef Cook-Off. The books are a mixture of older contest books and some more recent. Thank you for thinking of me, Sherry! It was so sweet of you! This is the best thing about writing blogs and the people who find it. It has enabled me to meet the sweetest, kindest people across the country and share our delight in everything culinary related. I want to thank you for sharing all of your various posts! You certainly make your blog very special and it’s amazing how you’ve built back your culinary cookbook cellar with the generous donations from the various people whom you have been connected with! I’m an avid recipe collector since I was young! I’m still collecting recipes-mostly now from Taste of Home, although I’ve gone on Amazon and have ordered various cookbooks! I’m also a Volunteer Field Editor for TOH and now there are cookbooks in which I’ve tested chosen recipes and submitted them after working to create the recipe(s) I tried! I’m so happy you continue to enjoy the blog, Dawn, and that we are fellow recipe collectors! Keep up your great Taste of Home recipes. It’s a very popular magazine and many people will find the great recipes you have developed.